Any thin, flat layer or sheet of membrane or other tissue. It may be a part of a larger structure. The lamina is the expanded portion or blade of a leaf and it is an above-ground organ specialized for photosynthesis. For this purpose, a leaf is typically, to a greater or lesser degree, flat and thin, to expose the chloroplast containing cells (chlorenchyma) to light over a broad area, and to allow light to penetrate fully into the tissues. Margins: The boundary area extending along the edge of the leaf. Vein: A vascular bundle (the ribs) at or near the surface that provides supports for the leaf and transports both water and food. 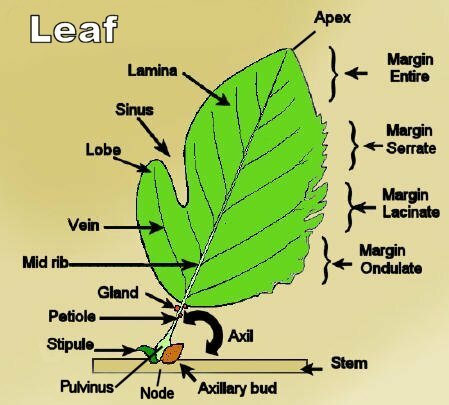 The Adaxial or ventral surface: is the upper surface of a leaf lamina facing toward the stem. The Abaxial or dorsal surface: of a leaf lamina is the underside or side facing away from the stem.